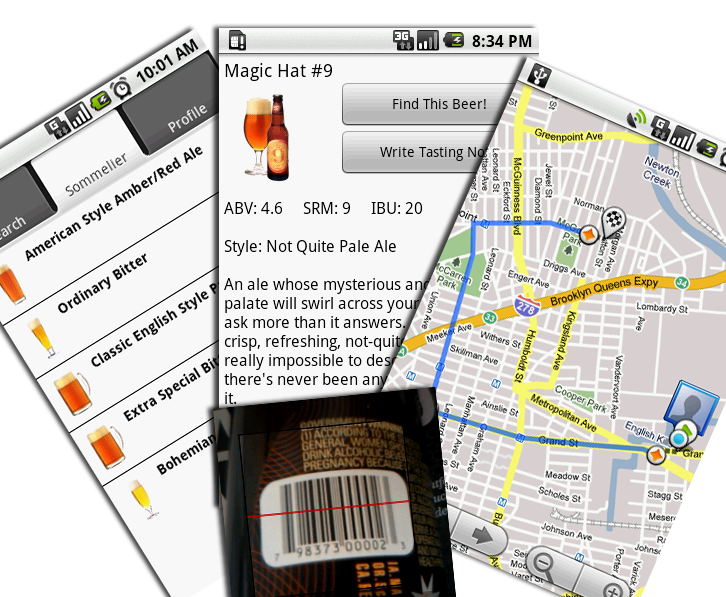 Created by GreatBrewers.com, BeerCloud helps you pair beer with food, track down your favorite beers in your neighborhood, and pull up a full description of any beer with a scan of its barcode. Scan the barcode of any beer to view the brewer’s description, specifications, and food pairing suggestions. Discover recommended beer style pairings for your next meal using the intuitive “sommelier” feature. Map the closest bars, restaurants, and stores actively carrying your favorite beers. See a list of current beer offerings at a local retailer. Seamlessly manage your saved tasting notes, favorite beers, favorite brewers, and favorite places to buy beer with your GreatBrewers.com account. Today’s beer drinkers have access to a far greater variety of beer than ever before, but with thousands of unique offerings representing more than 140 distinct styles, consumers can easily get overwhelmed. BeerCloud simplifies the process of learning about beer at the point of purchase, choosing the perfect beer to pair with a specific food, managing favorite beers and favorite brewers, and mapping the closest bars, restaurants, and stores that currently offer one’s favorite beers. To provide highly accurate, perpetually updated, location-based availability data for thousands of beers at nearly 100,000 bars, restaurants, and stores, BeerCloud’s developers teamed up with dozens of America’s leading beer wholesalers in the Great Brewers network which collectively represent more than 400 domestic and international breweries. Brewery provided company profiles and product descriptions empower BeerCloud with the most comprehensive beer database on the planet. Culinary guidance from leading connoisseurs provides thousands of harmonic beer and food pairing recommendations in the Beer Sommelier. With this powerful lineup of information built into GreatBrewers.com, Jingsheng Wang engineered an API for the Drupal website to seamlessly integrate content and saved user information with the BeerCloud mobile application. Barcode Scanner, The library to support scanning beer UPC-A bar code. Services, turn Drupal into a services back-end for Android. Also, the API will be used by iPhone App, or other desktop application. Views, Many many things are built on Views. Product Catalog is one of them, but Views is too slow for Product Catalog, so re-engineering is necessary. Also, together with Node Reference, we can pull any data together. All the data is available through Services gateway.